John Hayes Walks: Munich to Venice - how tough is the Traumpfad? Munich to Venice - how tough is the Traumpfad? One of the first question's most people ask before deciding to go on a trek like Munich to Venice is 'can I do it?'. To be honest I had a bit of a 'discussion' on this issue with Cicerone who felt that only the experienced should attempt a walk across the Alps. The trouble was this didn't fit with the sort of people I met on my transalpine journey many of whom had never done a long distance hike before. All sorts of walkers were doing the trip: lots of young people with very little money; lots of older people, particularly the recently retired on their first post-work adventure; and, as well as couples, lots of single people, including solo women. It wasn't hiking experience that these people had in common, it was a sense of adventure. Ludwig Grassler designed Munich to Venice route for any 'able-bodied walker'. You do however need to be reasonably fit and have a head for heights. It's a 30 days walk and you'll be carrying around seven kilogrammes for around seven hours and climbing an average of 1000 metres a day. There are also some exposed stretches of walking although these are invariably supported by cables. In addition to a sense of adventure, reasonable level of fitness and a head for heights, you also need to be sensible. Walking at 2000 metres in the sunshine is one thing, walking in a summer thunderstorm or even snow is another. As well as having waterproofs, warm clothes and the ability to navigate when visibility is low (a smartphone loaded with GPS in a waterproof container) you to know your limitations, take weather advice and act accordingly. What makes the Munich to Venice accessible to a wide range of walkers is the hiking infrastructure. On the alpine stretch, more than two-thirds of the total route, accommodation is available is mountain huts (like youth hostels) which mean's camping experience isn't necessary, loads are light and, if the weather is bad, there is somewhere safe to stay. The routes of well marked, getting lost is relatively difficult, and the exposed stretches, as mentioned already, have ladders and cables by way of assistance. When it comes to helping ordinary walkers go to extraordinary places nowhere in the world compares to the Alps. So don't be put off, if you have a sense of adventure and want to do something special, then next summer get on a plane to Munich, find the Marienplatz and start walking south. Dear John, it's a pleasure to read your blog. my Name is Thair Abud, I live i Austria. I already walked from my home City Graz / Austria to Finisterre / Spain 3.250 km and from Graz to Salalah / Oman 8670 km. more about me, you kindly find my blog www.ontheway.today and on FB Thair Abud. It will be a pleasue for me to Keep in contact with you. Hello John. I recently came upon your post regarding the Carnic way along the Via Alpina. It was the most informative piece of info on the hike and showcases the stunning scenery we are hoping to enjoy.I am hoping that you will contact me regarding the stretch between the Neue Porze hut and the Hochweissteinhaus. We are planning to hike the Carnic way in july 2017. We are both in our 50's, fit and have hiked the Alta Via one. We are concerned about the 'exposure' on the above stretch of the Carnic Way and hope you could expand on that for us. Many thanks I hope to hear from you! I'm currently writing a guide for the KH so know it really well. There are a couple of cable assisted stretches one of which pulls you up a short chimney but it's really not difficult. For the last hour you can either go straight across the valley or take a contouring route round it, go straight across the valley! The day is the best day on the whole KH, and definitely not to be missed. My guide will be out next year. You can definitely walk the whole walk in 2 weeks starting at Sillian and finishing at Arnoldstein. There are however lots of options,lots of local variants and plenty of different ways off the walk. I will do Munich To Venice trek with friends (without a guide), on august. In the book with the reference: CICERONE, they said about charges "A reasonable rule of thumb is to budget 50 euros a day". I precise that it's not an organized trek. So for me 50euros a day is very expensive. Please, do you know how much is the price of the hostel (without eat in)? Glad you've chosen to hike Munich to Venice, it's a great trek and you will enjoy it. Rates do vary a bit but if you join the Alpine club you get half rate on a place in the dormitory which is usually around 12 euros. Expect to pay extra for a shower and some alpine huts even charge for charging the phone. It's the same everywhere in the Alps I'm afraid, it's not a cheap place to hike. Half-board is usually around 30 euros and you will probably get away with making a sandwich for lunch if your careful. Have a great trip and send me some photos. Hi John - I have purchased your book (Trekking Munich to Venice) and I am very happy with it. 1) Do you need to bring cash along for the walk or will a credit card do? 2) How do you get water along the route? Only at huts or are there plenty of pure water streams? Michael, your in for a treat! Personally I would take cash and a credit card. Most huts accept credit cards but there are also little farms and other places that want cash. You can fill up at the huts for water but chunks of the trip are through limestone and I can't remember which one, but even the hut sells bottled water. Some of the streams will be OK but there's a lot of glacial gritty water in the streams. It looks like the passes will have snow until quite late this year, so something to watch out for. John - thanks a bunch for your quick reply. Where do you read about the passes having snow? I am considering going from July 14th to August 4th - starting my hike from Hall on the 15th of July. Is that a no go this year you recon? If snow is there late will it perhaps make better sense to start out from Venice? Hi John: I’ve just bought your cicerone book and hope to do the whole walk along the Carnic Trail next year. I have a question about section 4a which appears the most challenging cable section. I’m a little elderly, 68, but comfortable enough with scrambling at the level of say, striding edge in the Lakes or Highland Munroes, but have no real experience of assisted routes. I did the Tour de Mont Blanc this year and was happy enough with the section of cables and ladders on that. Are the cable sections on this walk of a comparable level? I’ve been doing a bit of reading up on via ferratas and some look a bit scary. For example would I need to take a harness and via ferrata set for this walk? Are there any cable bridges? I had a large pack with camping gear on the TMB but would travel lighter on this one with no tent. Thanks for buying the book and I'm sure you'll enjoy the hike. I haven't done all of the TMB so can't draw a direct comparison but no you don't need to take a via ferrata set for section 4a. There is a ladder at the beginning that takes you up through a chimney and after that cables are there to assist as you traverse your way up an otherwise very steep slope. I'm not a climber, have almost no climbing experience, so what made this section special for me was the extent of the cable. I've done it twice - once with a woman I had met the day before and who wanted to share her first trip and once with my wife (she was 67 at the time). It's a well maintained route and when I last did it the cables were in excellent condition. It's south facing, there shouldn't be any snow to contend with and, providing you don't attempt it in bad weather, the light should be could. It is spectacular and the hut at the end of the stage is amazing. I bought the guide for Munich to Venice and have spent the weekend getting very enthusiastic. As a young man I spent time walking and climbing in the Zilartal Alps, but my youth and climbing days are a long way behind me now. I am confident I am fit enough for the walk especially with judicious use of cable cars and I'll put up with crowded huts, but the nature of the "black" routes gives me concern. How difficult are they? What is the risk of an accident? and what is the jeopardy? I walked the length of the John Muir Trail in the High Sierra recently which had high passes and late snow. Just how serious are the black routes? There are stretches of exposed trail, the black routes, where a missed footing could result in a serious accident. The most exposed stretches have cables and ladders. 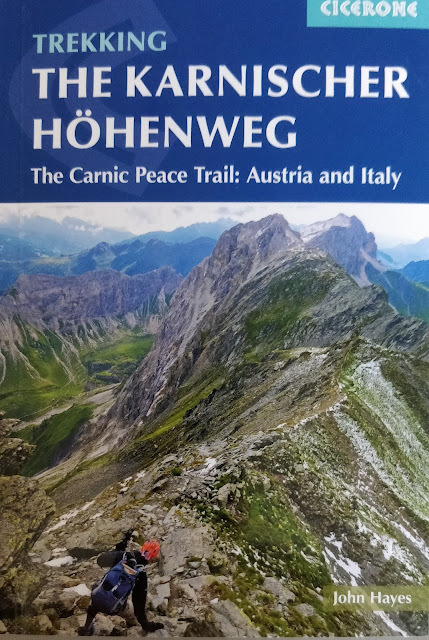 Munich to Venice follows well trodden routes, easier to follow I suspect than the John Muir Trail, but accidents do happen and indeed a walker fell to his death last year on his first day in the mountains proper. The Alps are far and away the world's most popular and best resourced mountain walking destination and thousands of people enjoy them every year. Munich to Venice utilises existing routes but it is not without its risks.